Sell to Us Price: $16.09 each. Money Metals Exchange is pleased to offer the world's most popular silver coin - the 1 oz American Silver Eagle - with the 2018 date. The US Mint has been minting the 1 oz American Silver Eagle, since 1986. Like our bullion coins, such as the Canadian Maple, each American Silver Eagle contains a minimum of one troy ounce of .999 pure silver. The weight and purity of each Silver Eagle coin is backed by the US government. Introduced in 1986, the American Silver Eagle coin weighs in at one ounce of silver (99.9% pure silver guarantee), authorized by Title II of public law 99-61 and certified by the United States Mint. US Mint Silver Eagles have a very strong sales history, having immediately sold out when released in 1986 and at many times since. Its popularity continues, as evidenced by its 2014/2015 record breaking sales figures. In 2014 alone, an estimated 44 million coins were struck and sold, rising to approximately 47 million in 2015. At several times in recent years, the mint had to postpone or ration sales of the coin due to high demand! Government mismanagement is part of the reason for the scarcity at times, but that is not the only reason. What makes this one ounce silver coin so popular? The coin’s striking design is one reason. America has often been represented by its symbolic images - whether this be the statue of liberty or the stars and stripes on the US flag. Why Buy 2018 Silver Eagle Coins? Money Metals believe fine silver coins are generally purchased either as part of a collection, for profit, or as financial insurance. The immense popularity of the 2018 1 troy oz Silver American Eagle dollar make it a mandatory part of any portfolio, and its value is priceless as consideration is paid to what it symbolizes. Other people buy silver bullion coins as a hedge against inflation and in today’s unknown economy, uncirculated silver eagle coins are an excellent choice of investment. Silver bullion coins can also be held in self-directed individual retirement accounts (IRAs). Although the beautiful coins only have a face value of $1, their intrinsic value is a lot higher and dictated by the price of silver at the point of sale, along with the coin’s silver content. Where Can I Buy 2018 American Silver Eagles? Buy your 2018 American Silver Eagle coins from Money Metals Exchange, and not only will you be guaranteed a low price, but you will be conducting your business with an internationally acclaimed business company with more than 7 years in the industry. Unfortunately, as with many industries over a variety of markets, bad actors and poorly run suppliers exist. When you buy 1 oz silver American Eagle Coins from Money Metals Exchange, you can be assured that our years of experience and moral and ethical considerations combine to give you peace of mind, fast delivery times, and high quality products and services. What is unique about Money Metals Exchange, is that we place our customers at the heart of our operations - educating them while providing them with the lowest cost for each product. Although the costs may be low, quality of both service and product is not compromised. We are currently selling these coins for any quantity you require and can provide you with extra discounts if you wish to buy 1,500 or more. If the spot price is not where you want it to be, choose the ‘Price Alert’ option on the right hand side of the screen, and you will be notified when the price reaches your target. Whatever your reason for buying or selling, Money Metals Exchange is the right choice for you. Our current buy pricing is $16.09 each and we will buy up to 1,000 ounces at this price. Simply call us on any weekday to lock pricing at 1-800-800-1865. 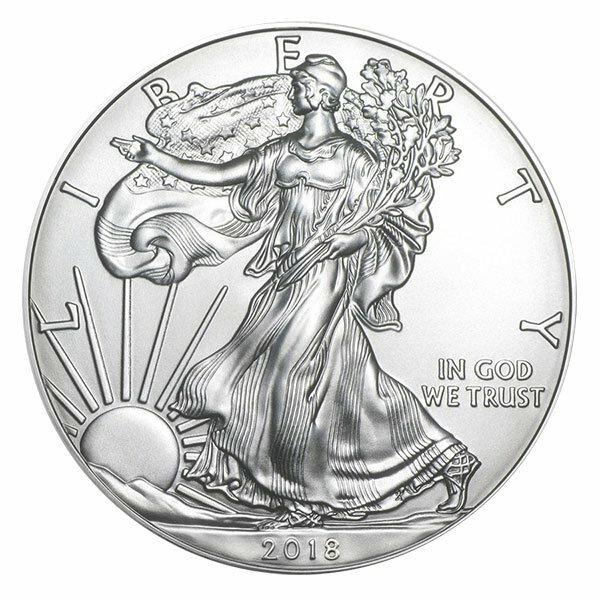 You can now sell your 2018 Silver American Eagle - 1 Troy Ounce, .999 Pure back to us online, at a price of $16.09 each!